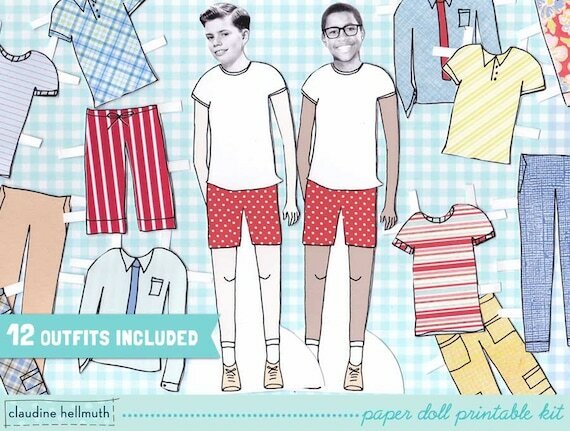 Super easy to make pre-teen boy paper dolls using your own photos! A fun gift for birthday parties and anytime you want to make your friends or family smile! I've designed these dolls so that you can use the included dolls in the set or easily customize yourself using your own photos. It's really simple for you to add your own photo heads! You can use a computer or just as easily add your new photos by hand. Complete instructions to cut and add your photos by hand are included for you! Print and make as many as you like for your own personal use! Dolls are packaged as a 10 page high resolution printable PDF that comes as an INSTANT download delivered to you via email. You will be ready to get crafty in minutes! ★ 10 page high resolution PDF file of illustrated paper dolls you will love! ★ complete written instructions to cut and add your photos by hand are included for you! This pre-teen boy doll is approx 7" tall. See reference image above to check how the size relates to other doll sets that I offer. When customizing with your own photos, this doll size works great for boy ages 7- 15. I have a man, little boy and baby sets for other ages. You can easily scale the dolls to fit 1/12th scale miniatures. Simply print at 70% which will make the preteen boy approx 4'6" doll in 1" miniature scale. All files are formatted to 8.5" x 11" letterhead sized sheets to be printed in portrait orientation. Actual document size is 8"x10" so that the file will also print on A4 paper. Depending on your printer and monitor, colors may vary slightly from photos.